The navy I joined was roughly split four ways geographically: Portsmouth, Devonport, Chatham and Scotland — Scotland could be further divided into Rosyth and Faslane. Most ratings had a preference, those partial to Portsmouth were Pompy Ratings, those who preferred Devonport were Guzz ratings, these two were the main groupings, Chatham's star was waning and Scotland...well I understand that some actually volunteered for Rosyth and Faslane, there's no accounting for taste. When I joined Opportune she was an SM1 boat, based in HMS Dolphin, Fort Blockhouse, Gosport. I never really took to Gosport as a base, no particular reason, but as most of my first stint based in SM1 was spent at sea it wasn't a problem. The accommodation in Dolphin was fairly basic in those days. Opportune's crew had dormitory mess above the galley in; if my memory serves, Vulcan block. The NAAFI club was in Rosario Block and was very convivial of a lunch time when the boats were in. I always remember the Squadron Chaplin, a cherubic bearded character, moving from table to table, crew to crew, getting slowly plastered on their insistent hospitality. There was the usual good natured banter between the various ship's companies, often sing songs before falling back down the boats to continue maintenance. It was, I suppose, a continuation of the 'tot time' tradition which had been cherished in the navy since the seventeenth century and only recently (at that time) abolished to much wailing and gnashing of teeth. It was a practice which was, if not actually sanctioned by the executive, was benevolently tolerated. The delights of Gosport itself were reached by a twenty minute walk over Haslar Creek via Pneumonia Bridge, or, to give it its correct name, Haslar Bridge. In those days it was a rickety pedestrian bridge across which the wind whistled, nowadays it's been rebuilt, wider and stronger, to take road traffic; the wind, no respecter of progress, still whistles across it. The nearest hostelry on the Gosport side was The George and Dragon, inevitably referred to as the G and D. Although this did a brisk trade with the rakes from SM1, the real submarine pub in Gosport was the RA, the Royal Arms. A family run pub (I ought to know the landlord, landlady and their lovely daughter's names, but I can't recall them*) it provided a welcome, frequently cranky in nature, to all submariners. There were high old times in the RA, full of laughter, song and irreverent humour. One of the problems with Gosport was that, once the pubs had closed, there was no nightlife. For late night drinking a trip across the harbour to Portsmouth was necessary. Beasty's Bistro in Southsea was one such mecca, a seedy place in retrospect, but that didn't stop us going there. The big problem with Portsmouth was that the Gosport ferry stopped running around midnight. The two alternatives you had were either to get a taxi all the way around, very expensive, or to get the Port Auxiliary Service (PAS) boat from HMS Vernon. Although the PAS boat was free, there was the problem of getting past the Regulators at Vernon's main gate; a deep breath and hope they didn't want to chat. The PAS boats were infrequent, so a cold wait in the waiting room was often necessary. I spent a lot of time waiting for the PAS boat at Vernon and even, on one occasion, slept through its visit. By the time I left Opportune she was once again an SM1 boat. By this time I'd developed an interest in naval history, so the opportunity to visit Victory and the Royal Navy Museum was welcome. I'd not let on that that was where I was going though, I'd say I was off to the Yorkshire Grey or the Borough Arms or some other such dive — fear of being thought anchor faced again I'm afraid. Towards the end of Opportune's commission news came that we were to refit in Devonport. 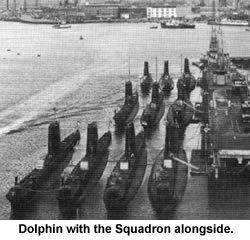 Initially we were to return to SM1 when the refit was complete, however shortly before leaving Dolphin it was announced that Opportune would be joining SM2, Devonport. To the many Pompy ratings in the crew this was bad news, personally I was happy enough, as I said, I didn't particularly like Gosport. I took to Guzz from the start. I've always found the people more accepting of the navy in Plymouth than in Portsmouth where we were 'effing skates' to some of the locals. Union Street was a lot of fun in those days, even the fights seemed good natured, you didn't need to travel far for a nightclub nor worry about ferries back. There was no particular 'submarine pub' when I was first based in Guzz, although the Star down Union Street was popular with submariners. The Star is long gone but it was a real old time rough cider house. The landlord would only sell the vintage cider (vints) by the half-pint, such was its potency and, after last orders, any dregs in glasses was collected up and put back into the barrel. I'm sure there must be a European directive against this practice nowadays. By closing time the floor was awash with spilt cider — and worse. The clientele of the Star was an 'interesting' bunch, you could be assured of finding an eccentric or two, and there always seemed to be some woman prepared to expose her breasts for the enjoyment of the company. If Hogarth had been in Plymouth in the early seventies he'd have done a sketch of the Star as a warning to rakes everywhere. The night club favoured by Opportune's crew was the Commodore Club in Cornwall Street. The Commodore was run by a flamboyant gay called Tommy who looked not unlike Danny le Rue without his frock. Tommy, and his huge, equally gay, but not to be trifled with doorman Peter, were great fun. It was, certainly by today's standards, a small club. Two rooms, one with a dance floor and disco (usually DJ'd by Ringo) and a quiet bar. Opportune's crew were such good customers that some of us were allowed to use the back door without paying. I seemed to spend every night, bar those when I was on duty, in the Commodore, staying until kicked out at 02.30; I couldn't do it nowadays. Being friendly with the management did have one downside, my parents came to Plymouth on holiday, to check that I hadn't found the other kind of woman no doubt, and it took some explaining as to why an outrageously camp blonde bloke was yahooing me from across the road. 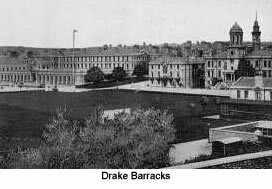 Single men, and married men with families up country, were 'vittled' in HMS Drake. Drake was slightly more laid back than Dolphin, although there was still a Main Gate to be negotiated whilst in your cups. But barracks life had its restrictions so I decided to become 'rationed ashore' and take a flat with a mate, Dicky Sawkins. Apart from the obvious advantages in having your own place, there was the (illusionary) financial gain of not having to pay the navy food and accommodation monies, so there was more beer tokens on pay day. The flat was a dingy two room affair close to the dockyard and we had some high old times there. Our local pub of choice was the Pym Arms, there was a pub two doors down from us called the Grapes, but it was a bit dismal. The Grapes is now the Two Ferrets and was run for a while by an ex-submariner Ashley (the Organ) Morgan and is far more fun. But the Pym Arms, behind Aggie Weston's, was a friendly back street pub where we could get tanked up before sallying forth to Union Street. Dicky was a talented mimic and I played guitar so we'd go round the local pubs having a great time and probably ruining everyone else's evening. I was becoming involved in the local folk music scene, going to folk clubs in the evening of which there were plenty in Plymouth in the seventies. There was also one on a Sunday lunchtime across the Tamar in the Edgecumbe It was necessary to get the Cremyll ferry to get there which was, and still is, a small foot passenger boat sailing from opposite the Marine Barracks in Stonehouse. These sessions became legend in the local folk community and beyond. Probably due to the close proximity of the Naval Hospital at Stonehouse there was a large contingent of scab-lifters and Naval nurses attending and the party started on the boat across. The drink of choice was Blackthorn cider and plenty of it. I took Alex Logan across once. I was suffering a dreadful hangover so Alex told me his secret cure "Get a gin top in yer cider Andy, that'll sort it". Yes, so it did, but the subsequent hangover was a real killer, almost literally. Dicky decided to have a fry-up back at the flat then promptly fell asleep. I surfaced from a semi coma to find the place full of smoke and the chip pan blazing up the wall, we were both so befuddled that it's a miracle we survived...ah, happy days. I can't really recommend the Blackthorn and gin top, I was so pissed that I did the Zulu Warrior on the boat back, and that's so not like me. The only other time I did so was at a rugby club in Halifax, Nova Scotia. I'd just divested myself of my last garment as the skipper and his wife walked in. Over twenty years later I still meet people who remember me from the Edgecumbe sessions; mercifully no one's yet mentioned the shameful episode on the ferry. It was probably due to folk clubs that I started using the Barbican area of Plymouth as a drinking venue. It was quieter than Union Street in those days and most of the pubs were still family run. I started going to the Barbican because some musicians I knew started a folk band which had a residency in the Wine Lodge on a Thursday night. I continued using the Wine Lodge long after the band had moved on. Along with Ian Arbon, Charlie Hindle and 'Fred' Bassett, it was part of our Friday night run. We'd start off in the Three Crowns with a couple of beers, move across to the Lodge for bottles of liebfraumilch and then head up town to Trees (or was it Woods) disco above Burtons to see how many shorts we could throw down in the space of an hour before, inevitably, finishing the night in the Commodore. It's a wonder I lived to tell the tale. The Dolphin Hotel was, and still is, a favourite. It had no other attraction than its excellent Bass ale and a clientele of eccentrics. Some of the more eccentric eccentrics were given nicknames after the Womble show. There was Uncle Bulgaria, who was prone to muttering to himself and bursting into bird impressions and Madam Shula who's speciality was picking her nose, rolling the result between her fingers and surreptitiously flicking it at selected targets. The Dolphin was presided over by the formidable landlady, Bet. She always sat on a high stool at the corner of the bar casting a steely eye over the assembly. Bet was not to be trifled with, she was quite capabl of stopping a fight between drink maddened fishermen with a single disapproving glare. Her son Billy now runs the Dolphin which has changed little over the last thirty years. That may be about to change for, at the time of writing, the Dolphin featured in a BBC cartoon based on the painting of Beryl Cook, Bosom Buddies. I still go there on the first Sunday of the month to play music with bunch of friends in the afternoon, you have been warned. I was never actually based in Faslane on the Clyde but I spent so much time there there on boats that it sometimes felt like I was. It seemed impossible to sail from Devonport without turning right at Landsend and heading for Scotland. 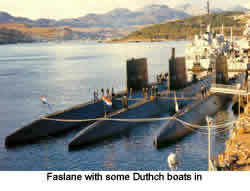 This was because submarine work-ups were undertaken in the Clyde areas and torpedo trials in the nearby Loch Long. The local town of Hellensburgh provided the entertainment, the two most popular bars being the Imperial and next door, the Royal; the Imperial (Imps) was a Glasgow Celtic supporters bar, the Royal favoured Rangers. Back in the seventies the licensing hours in Scotland were even more draconian than those in the rest of the UK. Closing time was ten o'clock in the evening. The choice was between getting a taxi back to the base, where more civilised hours were observed, or getting yourself invited to a party with a carry-oot. There were always complete strangers inviting you to parties, a by-product of the early closing time I suppose. It was often into a taxi and off to Dumbarton in the company of Jock and Jeanie. I awoke one morning in Dumbarton with not a clue where I was but knowing I had to be back in Faslane in an hour for duty watch. God, I felt like hell, thumping headache, mouth like a growbag, as I stumbled through a strange council estate. I was gasping for something to drink but there wasn't a shop in sight. Eventually I left the estate and found myself on a country road, I was that desperate I considered trying to lick some moisture from the evaporated puddles in the road, then, and this falls into the category of miracles, I saw a bottle of Irn Bru n a hedge. At least, I hope it was Irn Bru, it was the right colour! Although I'm not a fan of Scotland's national soft drink, by golly it tasted good. When Scotland, well ahead of the rest of Great Britain, relaxed its licensing laws to allow all day drinking, the impromptu parties and carry-oots fizzled out; shame really.